Our products from the Czech Republic are made by the famous weapon producer "Alfa Proj". The quality of these restraints fulfil highest international demands - e.g. "Alfa Proj" restraints belong to the official equipment of the Egyptian police. Model 9900 is a more conventional type of handcuffs, which meets the NIJ standards. It is operated by a standard handcuff key. The key pin is used to press push buttons for double locking at the side of the nickel plated cuffs. To unlock the double lock, the key has to be turned counter opening direction. These Czech quality handcuffs have some special features. First of all, a small, non standard key, which can be inserted in the lock from both sides of the cuff. Then there's just a single chain link. Last but not least, the bows run very smooth, so that you can snap the cuff around the wrist easily. Sure that the handcuffs can be securely double locked. Ralkem 9924 handcuffs are a special version of the 9921 shown above. Here the double lock is not activated by key but via small buttons on the sides, which can be simply and quickly pressed by finger. Otherwise they have the typical Ralkem-advantages: a non standard key that can be inserted into the lock from both sides of the cuff and bows, which run very smoothly, so that you can snap the cuff around the wrist easily. Ralkem 9922 handcuffs have the same advantages like the 9921: a small, non standard key, which can be inserted in the lock from both sides of the cuff and bows, which run very smooth, so that you can snap the cuff around the wrist easily. The double-hinge is making them very restrictive. Sure that the handcuffs can be securely double locked. Ralkem 9927 handcuffs are a special version of the 9922 shown above. Here the double lock is not activated by key but via small buttons on the sides, which can be simply and quickly pressed by finger. Otherwise they have the typical Ralkem-advantages: a non standard key that can be inserted into the lock from both sides of the cuff and bows, which run very smoothly, so that you can snap the cuff around the wrist easily. The double-hinge is making them very restrictive. The ergonomically shaped Ralkem leg irons have all the advantages of the Alfa Proj handcuffs. They are very smooth running and the key, which is identical to the handcuffs' key, can be inserted from both sides of the cuffs into the lock. The double locks are fast and easily activated by buttons which can be pressed just by using a finger. Compared to most leg irons from other manufacturers, the chain is quite short - only 13.5 cm. This is a perfect combination of Ralkem 9921 handcuffs, which are connected to Ralkem 9925 leg irons by a 83 cm chain. Different from the solo leg irons, the chain between the two cuffs is about 33 cm long. All four nickel plated cuffs are very smooth running and the key, which is identical to the handcuffs' key, can be inserted from both sides of the cuffs into the lock. Needless to say the handcuffs as well as the leg irons can be securely double locked by pressing the button (this is different to the Ralkem 9921 handcuffs). One part of the Ralkem 9923 is an identical cuff like at model 9921, but instead of the other cuff there is a 20 cm long chain with a large rectangular end piece. The cuff can be looped through this end piece to attach the restraint to a fixed object or the handle of a case without needing an external padlock. The double lock is activated with the shaft of the key just like at model 9921. 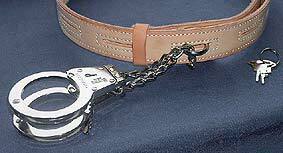 This prisoner transport belt is made of 0.5 cm thick leather. It's 132 cm long and there are many 4 cm long slots to make it fit for waist sizes between 60 cm and 118 cm. The belt is securily closed by first putting a steel hasp (in shape of a D-ring) through one of these slots and then pulling a looped chain, which is connected to the belt, through the hasp. Finally you pass a pair of handcuffs (e.g. Ralkem 9921 or 9922 - not included) trough the chain loop and close the cuffs around the prisoners wrists. Now the belt cannot be opened without removing the handcuffs first. This handcuff-pouch is made of black leather and uses a push button to open and close. 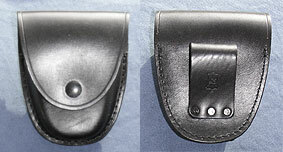 The holster's measurements are: 11 cm (width) x 13 cm (high). It's about 4 cm thick and its opening is 9 cm wide. This holster fits to larger cuffs. If you're not sure, just ask us.